Welcome to Sea Star; where luxury meets tranquility. Sea Star offers an immeasurable Ultimate Beach House vacation experience with uninterrupted Gulf Views, the seclusion of a private – Gulf front pool, effortless beach access with daily beach chair set up, and substantial room for everyone to roam. The kids will take delight in a game of Pool & Ping Pong, or break-in the recently added Arcade Games ALL While the adults relish in the lavish, fresh new interiors & updates completed March of 2019. Bask in the Summer sun next to the private Gulf front pool which, if desired, can be heated when it’s cooler. Furnished with ample loungers, tables and chairs, there is surely enough room for everyone to take in the emerald waters and salty breeze. with the added convenience of a private beach access from the pool patio, and heated outdoor shower, Sea Star’s outdoor space will allow the rest & relaxation you deserve. Sea Star’s recent remodel is sure to set your vacation up for success. Accented with professional interior designs & updated fittings, you’ll have everything you want & need to put your mind at ease. Nourish your inner child with the array of arcade games, billiards, & ping pong found on the first floor, or enjoy a movie with your favorite people on the plush sofa. You’ll relish in your cup of coffee, made with a Miele Coffee Maker, from the updated & well stocked kitchen. The first floor offers two bedrooms, both with king size beds, and access to shared bathrooms. Hop on the BRAND NEW elevator to the second floor where sparkling emerald views will welcome you! The second level provides a newly remodeled & professionally decorated open concept kitchen, living & dining area. The kitchen is suited with top-notch appliances, like a Wolf Gas Range, a Viking Refrigerator & a second Miele Coffee Maker; well equipped to provide all the modern conveniences to any host. On the second level Sea Star provides two Gulf View bedrooms, both furnished with king size beds, en suites & private access to a shared balcony. An additional king size bed is also located on the second level and has its own private bathroom. The kids will sleep sweet in the second floor bunk room, furnished with two twin over twin bunk beds. en suite included. Fit for royalty, the 3rd floor master suite is sure to be the calm you need after a busy day at the beach. Drink in the Gulf views from the king size bed, separate living area, or private balcony. find your tranquility in the recently remodeled master bath, with glass enclosed shower & over-sized soaking tub. 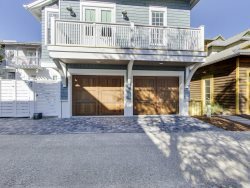 Guest have access to the garage, which allows parking for two, additional parking for six in the driveway. Looking for the Ultimate Beach House?! Look no further, reserve Sea Star today! We stayed at the 30a escapes property called Sea Star this summer and had a fantastic time! The home was beautifully appointed. We really enjoyed the bicycles and having the chairs setup for us every morning on the beach. That was crucial! A lot of people come to the beach and it was nice having the chairs set up early enough that it kept our space reserved. We also had a lot of fun with the ping pong table in the garage! Who knew that would be so fun! The bedrooms and bedding were great. The home layout was perfect. The beach and water were beautiful. White sand. Clear water. We've been driving to Hilton Head for the past twenty years and this was our first time heading down to 30a. We're definitely coming back this year too! The water and beaches make it much nicer. The staff was courteous. The area is great. We honestly had one of our best vacations ever. Great company and a wonderful house! Thank you for everything! The staff is responsive, friendly and very helpful. Property is beautiful and very well setup for a large group. Dylan was fantastic! The ease of everything from making reservations to checking in and out was amazing! Beyond perfect! The beach house was absolutely wonderful! Having our entire family under one roof was glorious! Being right on the beach, having our own pool and close to shopping, restaurants and in a beautiful home, could not have had a better vacation!